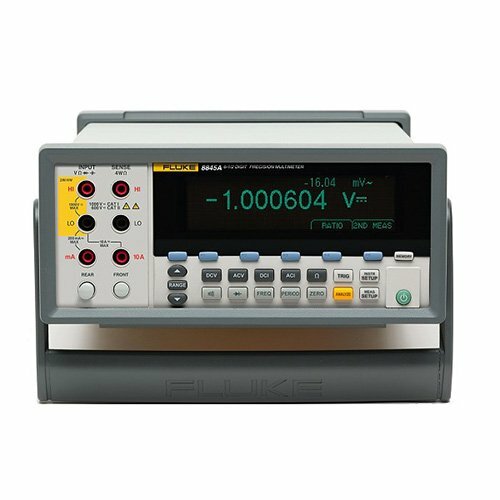 The Fluke 8845A 6.5 digit precision multimeters have the precision and versatility to handle your most demanding measurements, on the bench or in a system. These meters are both high performance and feature rich, yet also remarkably easy to use. These digital multimeters perform the functions you would expect to see in a multifunction DMM, including measuring volts, ohms, and amps. Basic VDC accuracy of up to 0.0035 %, 10 A current range, and a wide ohms range give you an unbeatable combination of measurement capability. You can also use the Fluke 8845-A to measure frequency and period. In addition, the Fluke 8846A measures temperature and capacitance. The functions of a counter, capacitance meter, and thermometer are built in for unparalleled versatility. Extend the meters' utility even more with their graphical display modes, including Trendplot paperless recorder mode, statistics and histograms—features you won't find on other multimeters. Of course, these meters are also durable and dependable, features you expect from any Fluke meter. This unique combination of features and performance makes the Fluke 8845A an unbeatable value for a wide variety of applications, including manufacturing test, research and development, and service. The Fluke 8845 features a unique dual display that allows you to measure two different parameters of the same signal from one test connection. To reveal signal quality issues like drift, intermittent and stability, view data as a real time trend plot or histogram, with the unique analyze mode. You won't find graphical display capabilities like these on any other instrument in this class.and stability, view data as a real time trend plot or histogram, with the unique analyze mode. You won't find graphical display capabilities like these on any other instrument in this class. Patented split terminal jacks for the 2 x 4 ohms function allow you to perform 4-wire measurements using only two leads instead of four. A special test lead accessory is available to enable you to establish the connection. You get excellent resolution and accuracy plus the convenience and ease of using a single pair of leads. Choose from several interfaces to connect the Fluke 8845 A/8846 A to a personal computer: serial, IEEE-488, and Ethernet come standard on both models. A USB device port is included on the Fluke 8846/A Digital multimeter for convenient data transfer to and from a PC via a portable USB storage device. FlukeView Forms increases the power of your Fluke tool by enabling you to document, store and analyze individual readings or series of measurements, then convert them into professional-looking documents. Log live readings while connected to a PC or store, display and share readings in interactive forms, graphs and tables. Create customized, professional looking documents that can be printed or emailed. FlukeView Forms software includes easy-to-use standard forms. Instrument programming drivers, DLL files and support information are included to get your test system up and running as quickly as possible. The Fluke 8845-A ships with a free copy of FlukeView Basic. Transfer data points from your meter to your PC and use the two standard, noncustomizable forms to display your readings in table or graphical form. For a larger array of forms or to use FlukeView Forms Designer to customize your forms, upgrade to FlukeView Forms version 3.0 with FVF-UG. The Fluke 8845A emulates operation and programming commands of the Fluke 45 and Agilent 34401. Emulation shortens the learning curve and makes it easy to fit the Fluke 8845A or Fluke 8846A into existing test systems.